Once upon a time, an engagement ring diamond purchase was pretty clear cut: You looked for a flawless, colorless, round cut diamond, as big as you could afford. Real diamonds came from the ground; anything else was “fake.” Those days are gone. There have been a lot of changes to the diamond buying landscape with the discovery and/or invention of diamond alternatives ranging from Moissanite to Cubic Zirconia (more on these later) and, most recently, lab-grown diamonds. If you’re in the market for an engagement ring, then suffice it to say you have your research cut out for you—but don’t stress. We explain it all below. We tapped industry experts to help us break down the diamond options you should keep in mind when buying an engagement ring. We’re weighing pros and cons and we have a comparative chart near the bottom of the article. You’re one step closer to making an educated decision, which means one more item off of the inevitably very long to-do list. Let’s do this. The first modern version of a simulated diamond was synthetic Rutile, introduced in 1948. In the 1950s Strontium Titanate entered the scene but, like Rutile, it was weak and not particularly durable. Fast forward to the next decade and we get Yttrium Aluminum Garnet (YAGG) and Gadolinium Gallium Garnet (GGG). 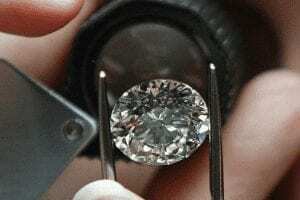 “YAG was actually used in Cartier’s replica of the 69.42 carat Taylor Burton diamond,” Taher says. 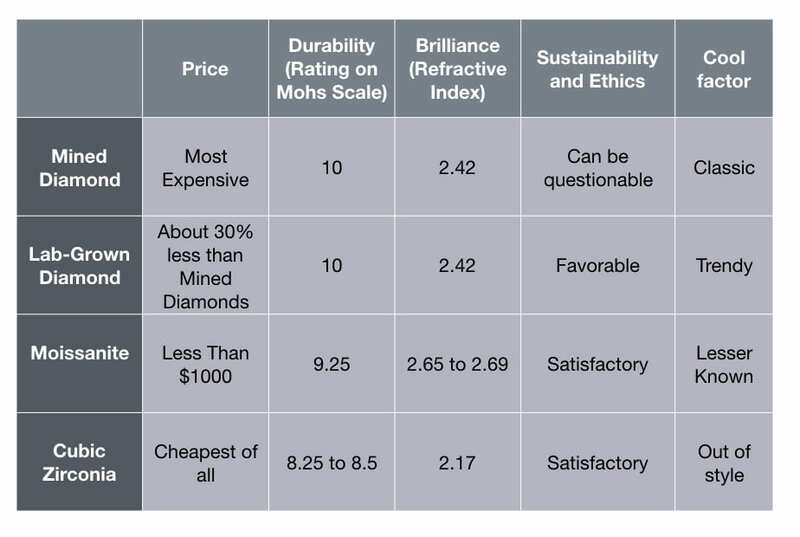 It’s an 8.5 on the Mohs hardness scale, so it’s hard but not as brilliant as a diamond (for reference, diamonds rank at 10 on the Mohn scale of 1 to 10 where 10 is best). GGG is softer than YAG but has more fire (“fire” here meaning dispersion, or that colorful sparkle you see when a diamond is exposed to light). 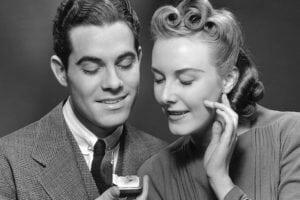 Cubic Zirconia came into the diamond market in the 1970s. It ranks 8.25 to 8.5 on the Mohs scale, is very brilliant, and has a high dispersion. “CZ is going to be the most cost-effective,” Taher notes. It’s true: there are CZ rings on Amazon that cost practically pennies ($25, to be exact). If you’re on a super tight budget and are skeptical about the diamond trading market, consider CZ. However, if you’re opting for something cheaper, then it may behoove you to look at trendier diamond alternatives like pearls or gemstones. Moissanite was originally discovered in its natural form (from a meteor no less) in 1893. Because of its natural rarity, most moissanite engagement rings use a lab grown form of the material, a practice that started in the 1990s. It’s a hard material (9.25 on the Mohs scale) and “has more fire than diamonds and CZ,” Taher explains. “It’s difficult to tell the difference between Moissanite and diamonds.” The synthetic versions of Moissanite are near colorless and significantly less expensive than diamonds, and therefore serve as a pretty solid alternative if your girlfriend wants something that really sparkles. Last year the Federal Trade Commission amended its Jewelry Guides in favor of lab-grown diamonds by removing the word “natural” from its definition of mined diamonds. In other words, a diamond is a diamond regardless of whether it originated from a lab or the ground. 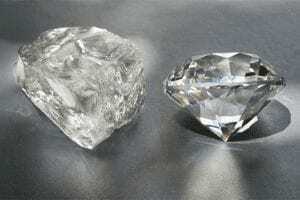 Atomically speaking, there are no differences between a lab-grown diamond and a natural diamond from a mine. If you’re interested in a more sustainable, reliably ethical stone, then this may be your best option. “Just to mine a 1-carat diamond, you end up having to dig up 250 tons of earth,” Goldenson explains. Diamond Foundry is the only producer that is certified carbon—which is made possible by proprietary solar technology and corporate best practices. In terms of price, on average a lab-grown diamond costs 20-30% less than a mined diamond (depending of course, on your choice of color, clarity, and weight). Last but not least, there are mined diamonds. You’re probably already familiar with the complexities of choosing a mined diamond but the easiest way to judge them is to use the 4 C’s: Cut, Clarity, Color, and Carat. These criteria are all intertwined and determine how expensive (or inexpensive) your diamond will be. A few important things to consider when buying a diamond is to make sure it is GIA certified (The Gemological Institute of America will analyze your gem and give you an official document). Blue Nile can have up to 250,000 stones on their site at any given point in time, all of which come with certification. Additionally, it goes without saying but we’ll say it just in case: insure, insure, insure. You never know what could happen and adding a safety net with insurance will give you much-needed peace of mind. Beyond the traditionally-mined white diamond, there are a few riffs on the stone that are currently trending. Salt & pepper diamonds, which are basically diamonds with so many inclusions (tbasically internal blemishes) they give the stone a speckled appearance, are having a moment. As are raw diamonds that haven’t been cut or polished. These are both more affordable options if your intended prefers less conventional rings. 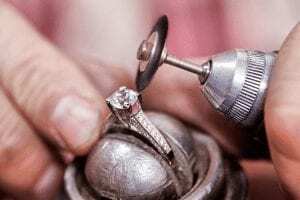 Blue Nile’s Zimmerman notes that “there’s not currently a trading market for lab-grown diamonds,” so eventually selling your stone to purchase a nicer one may not be an option. 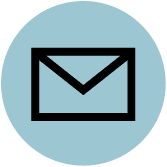 On the other hand, Diamond Foundry does offer a lifetime warranty, which means if you choose to upgrade you’ll receive a credit for the price paid for a diamond to put toward the new stone. Across the board, we recommend buying a diamond from a retailer you trust so if you choose to resale or upgrade down the road you can return to that same retailer and get (or save) the maximum amount of dollars in exchange. Whether that’s a mined or lab-grown diamond or Moissanite or Cubic Zirconia — or glass for that matter — ultimately depends on your budget and what will make your ring receiver happiest.